Kalani Largusa. Untitled. 66" x 96". Acrylic and water based media on canvas. 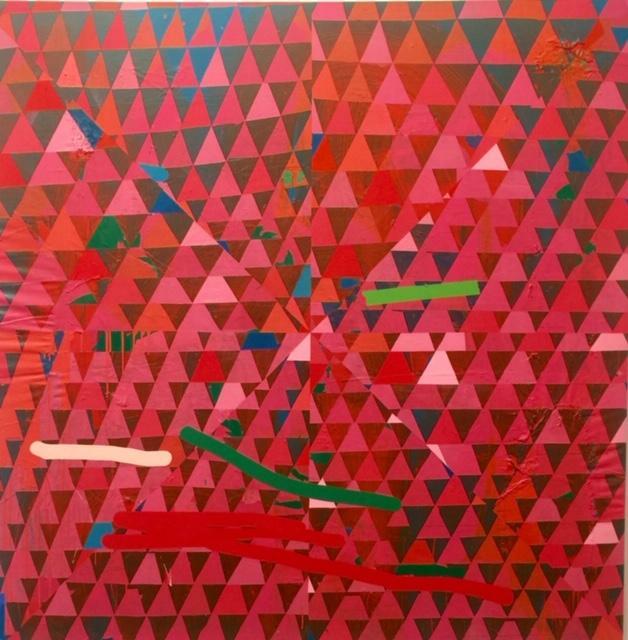 "Pink: Drexler Largusa" continues in the Commons Gallery in the Art Department at UH Manoa through November 30, 2018. A new show at the Commons Gallery in the Art Department at UH Mānoa makes a powerful case for abstract painting. Established painter and educator Debra Drexler is showing works with a newly minted professional painter, Kalani Largusa. Largusa offers thoughts about how to approach an abstract painting. Debra Drexler. Rose Slide. Acrylic on canvas. 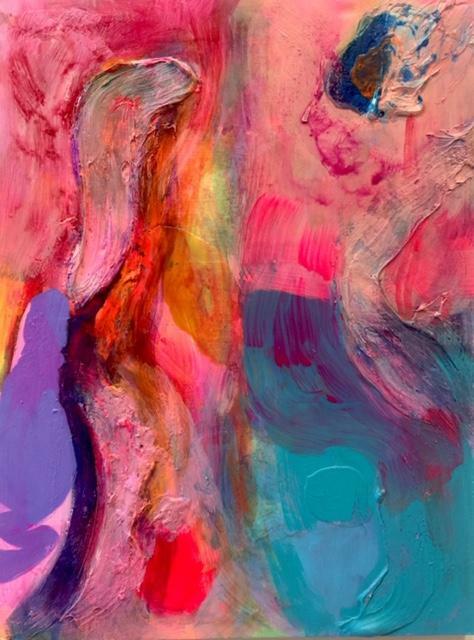 Painter Kalani Largusa offers tips on how to approach an abstract painting. Kalani Largusa offers an artist's perspective on painting. Recommended for painters. See the exhibition, Pink: Drexler + Largusa, at the Commons Gallery UH Mānoa Art Department through November 30, 2018. Mon. – Fri. 10:00 a.m. – 4:00 p.m.
Sun. 12:00 – 4:00 p.m.
Closed Saturdays; Nov. 6, Election Day; Nov. 12, Veterans Day; Nov. 22, Thanksgiving Day; Nov. 23, Non-instructional day. Kalani Largusa. and, for a moment, stood. Acrylic and water based media on canvas. Painter Kalani Largusa is from Kapahi, Kaua‘i. He’s done stints at the School of Art Institute of Chicago and at California College of Arts in San Francisco, and recently graduated with an MFA from UH Mānoa. He had intended to return to Kaua‘i, but a lack of suitable studio space brought him back to Honolulu. He has a studio now on the second floor of the old stone building at the corner of King and River Streets, and has painted about a hundred works in the last year. Largusa’s process is rather painstaking, requiring lots of layers and masking. Different techniques are layered over each other. Largusa: The piece itself is layers upon layers upon layers upon layers of color fields, and textures and patterns that come together to create something that for me at least begins to get interesting. There are things that are happening in the composition that are fun and different, but at the ame time, the opposite of what I was shooting for in terms of simplicity. Largusa: But it kind of just naturally and slowly pushed and pushed and pushed and pushed and pushed back until I really had to just commit to it and just go okay, let’ see where this goes. Let’s take this as far as I can take it. Earlier works by Largusa had tended toward strict linear abstraction in generally somber tones. 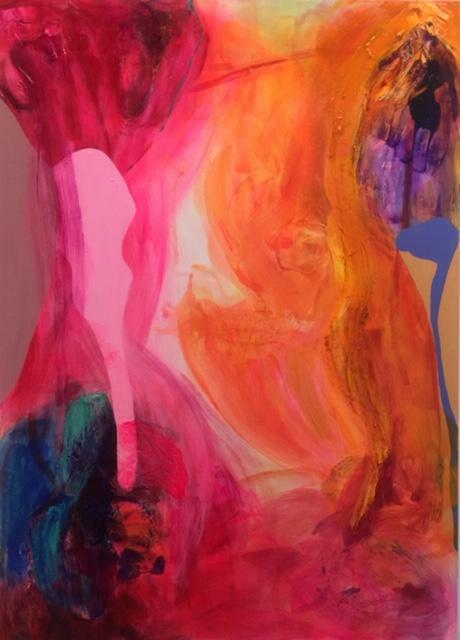 He has two large works in the current show, and one of them, Untitled, 66" x 96", looks like a particular departure. Linear patterns that look almost like video very close up, form a backdrop for huge "painterly" marks and happy/inquisitive loops. The show title is Pink, and both artists deliver. Debra Drexler. Cone of Uncertainty. Acrylic on canvas. Largusa: One of the great potentials with painting is describing and getting at things that are very difficult to talk about. So when it comes to conversation, most of the painters I know, we love to sit around and feel our way through things that are difficult to grasp. That’s all the fun is the exploration. Largusa: When you’re looking at paintings, I’m looking at edges. I want to look at clues, I want to dig back and look at the layers and trace the steps of the artist. Where they went, are there false clues? Is there anything that can tell me a little bit of truth about how this painting came to be? Those are always fun things. Largusa: At least the painters I know, we tend to play tricks with each other, impress each other with sly moves of color or texture. A little trickery. It’s always great to look at that. Largusa: Musicians will play with space and tones and tonal harmonies, especially if you’re thinking jazz. Jazz, they’re pulling out of the melody, throwing themselves as far out from the melody, and then pulling themselves back in again as a sort of challenge, to see how far you can take it and pull yourself back into it. Largusa: Abstraction in many cases works in the same way. That’s all the fun is the exploration. 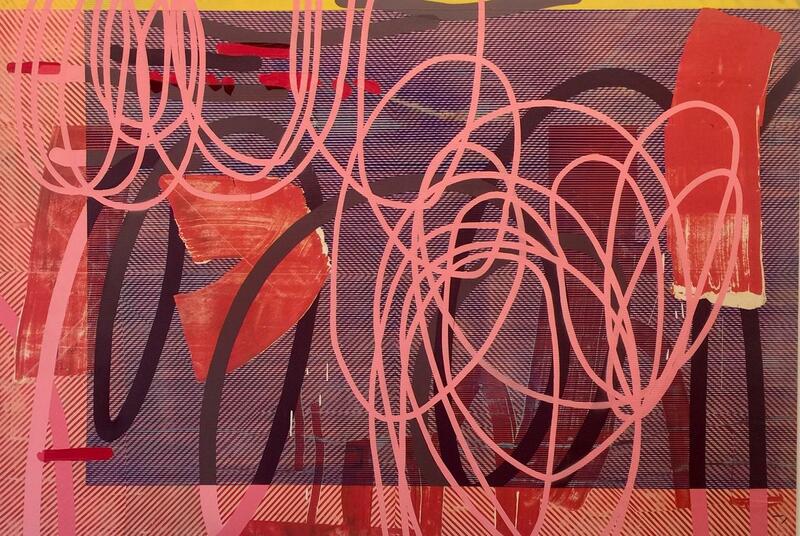 Debra Drexler's large canvases are exuberance in 2D, and very canny. Wordless expression can be such a joy.